Cut a square of neutral fabric 1" wider and 1" longer than your pillow form. I had a 22" pillow form so cut a 23" square to allow for 1/2" seam allowances all around. Anthro's pillow is off-white twill or lightweight canvas, but I used a tan cotton with a faint texture. I recommend fabric that's sturdy enough for home dec--if you use lightweight, quilting-weight cotton, also cut a square of muslin or cheap cotton to reinforce it with. You'll also want a fabric marker and (gasp!) --this is the weird part--a glue stick. Instead you could use spray adhesive, which is messy, or some kind of fabric glue, or a **** ton of pins, which would poke you like crazy and not hold things down in the right way, anyway. The glue stick is a lightweight hold that keeps the pieces in place until you sew them down. Start at the center. Fold your fabric in half twice and mark the center point. Cut a small circle for the center of the flower. Put a little glue on it and press it down. You'll create lots of little scraps!! Leave a little space between each petal. When you get toward the end of the process you may need very specifically shaped pieces, so you can use the fabric marker to trace the shape you need on the larger piece of fabric. See the faint lines I made? Now, to the machine. The original has white stitching going across each petal, but that looks like a LOT of sewing. Its petals are also zig-zagged down around the edges with a rust-colored thread, it seems, but that also sounds tedious. Sew the petals down however you like, but I oped for off-white thread in a straight stitch going around the edges of the petals. Not too bad to do all of them. I didn't cut the threads between each petal, so I had threads connecting them as I sewed--saves thread and frustration. It is also easier if you can lower the feed dogs so you can turn the seams in curves. OPTIONAL: If you really wanna copy the original, make some bias strips in a strong-colored fabric, and use cording to make piping around all four edges. I honestly meant to do this but totally forgot that I was going to until I had just sewn the front and back together!! Sew your zipper on both sides' bottoms, before you sew the side seams. Unzip the zipper most of the way and sew the other three seams. I like to fold the zipper side seam allowances back toward the rest of the pillow so that when you flip it right side out, they stay out of the way. Flip and turn the pillow cover right side out. Poke your corners out with a tool so that they make nice points. The Anthro original's back is solid orange. Do whatever you like! this is great! I've been meaning and meaning to make this pillow and now I have a tutorial. woohoo! This is a perfect thing for me to use up my scraps, and recover my ugly old pillows! Wha?! A glue stick! Why didn't I think of that?! It looks phenomenal! I was looking at the "origianal" on the Antro site and at closer look the diagonal petal stitching. it's hand stitched or hand quilted. I agree too tedious! Love the glue stick idea, I use it when I do hand aplique. I am a quilter and have bins FULL of scraps! Now something to make from them! YAY!!! I've been meaning to do this also. Only instead of making a pillow I wanted to make a picture out of beautiful paper. I love that pillow! Thanks for the step by step tutorial. I just found your blog and I think it's great. I, too, am inspired by Anthropologie! I went through some of your older post and now I can't wait for your next post! so cute! i might have to try it! 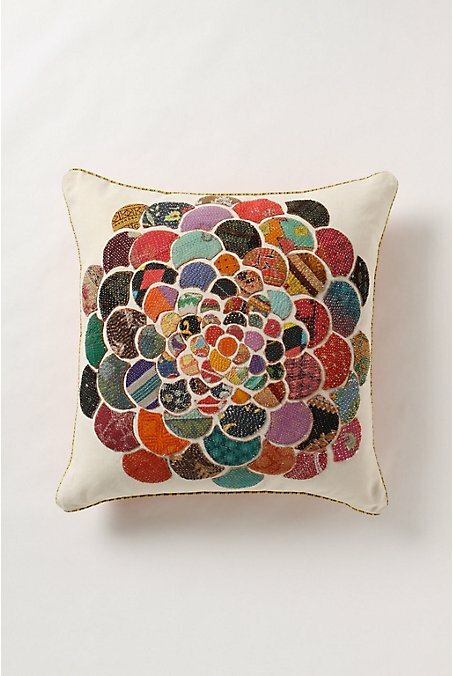 What a beautiful re-creation of this pillow! One thing I'd like to add is that I always cut my front and back the same exact size as the pillows I'm covering. This gives it that nice, extra-full designer look. If I cut the fabric even 1/2" larger than the form, it always ends up frumpy looking. Wonderful job - can't wait to see what you'll create next! You're right, @Lizzie; a tighter fit is always better on pillows! Great post! You could also upcycle garage-sale or thrift store clothing if you don't have any scraps! Genius! I absolutely love it! Beautiful! I now have a new, fun project to work on. Thanks! Thanks for sharing the link to this, I love your version, too! I'm so impressed with all the tiny petals you sewed on.